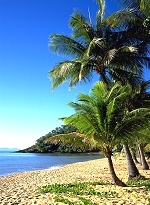 If it is excellent swimming beaches dotted with swaying palms you're after than head north of the city. Here you will find 26km of beautiful coastlines, and coastline towns - Machans Beach, Holloway's Beach, Yorkeys Knob, Trinity Beach, Kewarra Beach, Clifton Beach, Palm Cove and Ellis Beach. Each is a small, separate township with its own distinctive character. Together, the beachside towns provide much of the city's holiday accommodation, including island and mainland resorts, motels, holiday apartments and caravan parks. These beaches are where you'll find all the elements of an idyllic tropical holiday: warm seas, water sports, and miles of uncrowded sand with a sweeping backdrop of rainforest mountains. You can stroll, ride a horse at sunrise or sunset along the beach, sail, windsurf, jet ski, play golf, visit animal parks where huge crocs are hand fed, cuddle a koala and pat a kangaroo. You can even walk along the beach at night to find a restaurant. 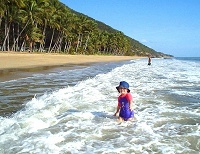 To get to the Northern Beaches there are regular bus services which operate between the beaches and Cairns city, with most accommodation houses providing courtesy coach services. Nearly all sightseeing and adventure tours include door-to-door transport. There are shopping facilities for self-catering visitors, including a large retail shopping mall at Smithfield. Smithfield is also home to the award winning attractions Tjapukai Aboriginal Cultural Park, and Skyrail, the cable car that literally takes you over and through the rainforest to the mountain village Kuranda.